Google Chrome Web Browser has been released for quite a while now (and I've been using it since then), but still many people don't know about it. Richard Byrne just posted a nice article with some videos about Chrome too, so I decided to revisit what I feel is the best web browser. I've written about it before (HERE and HERE and here is a good resource about web browsers) but want to point out some new features. Fast! Web sites load fast and web applications run quickly and smoothly. Simple! The browser takes up less screen area giving you more area to view your website. Combined Address Bar and Search bar - type a web address or search term in one box and you either go to the website or get search returns. Simple and easy. Easy tab use - open, close, and move tabs easily. Isolated tabs - if a web site on one tab crashes, it won't affect your other open tabs. Opens online documents using Google Docs. Easy to view all kinds of files. Themes - pick your theme (colors) for your browser. Bookmarks - sync your browser bookmarks across multiple computers using your Google account. Bookmarklets - besides having bookmarks on your bookmark toolbar, you can also include bookmarklets which are buttons that cause an action. Examples include: Clip to Evernote (clips the content to your Evernote account), Google Bookmark (creates a bookmark of the page you are viewing), Diigolet (which puts a link to the website into your Diigo account) and many more. 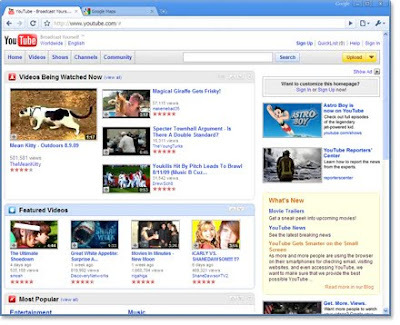 Extensions - extensions are add on programs for web browsers, and what made Firefox so popular. Chrome's development version supports extensions (and the main version will soon too). I only use a few so far, including Google Translate (of the page you are viewing), Internet Explorer tab (opens a tab in IE to view IE only websites), Aviary (perform lots of functions using Aviary's web based graphics editors), Blog This! (which clips a web page to your Blogger account so you can blog about it) and Google Calendar which tells me how long until my next appointment. 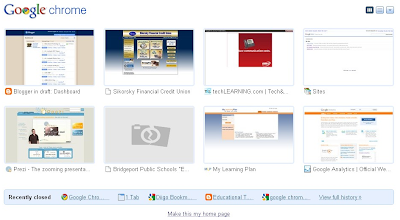 Favorites and Recently closed tabs - are all listed when you click on a new tab. This makes it easy to go to your most visited sites and to revisit sites that you have just closed. Customizable / Privacy settings - you can customize the way the browser looks and functions and you can set different privacy settings to protect your privacy while online. Stable and secure. Chrome is a very stable browser (I have had almost no crashes, ever, with Chrome) and very secure from attacks and hackers. This is just some of the features of Google's Chrome Web Browser. Try it out for yourself and see how nice it is.